Mahurangi West Wing provides private, luxurious bed and breakfast accommodation in a gorgeous setting on the edges of the Mahurangi Regional Park. Our home is built on a seven acre block of native trees and farmland. 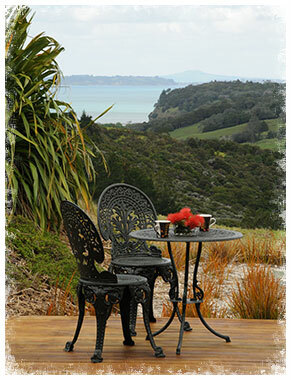 The bed and breakfast accommodation is in a private wing of our home and offers unrestricted views across farmland and regional parks to the sea: look out at Te Muri beach, Whangaparaoa peninsula, the Hauraki gulf and Rangitoto Island in one direction and the Mahurangi harbour in the other. Come, enjoy, relax and unwind. Mahurangi West is Auckland’s best kept secret. Just 40 minutes from Auckland, New Zealand’s largest city, Mahurangi West sits on the edge of the Mahurangi harbour and the Matakana coast. Mahurangi West boasts easy access to six different beaches, the picturesque Mahurangi Regional Park and the beautiful Mahurangi harbour: ideal for swimming, kayaking and boating. Should you wish to venture out into the Hauraki gulf, you are within easy reach of Motuora Island and bird sanctuary and many diverse diving and fishing spots. We are close to Orewa, Warkworth and the Matakana coast which offer fabulous scenery, boutique wineries, fine dining, farmers’ markets, shopping, cafes, art, culture and fun! Check out this video of our piece of paradise. Where are we exactly? Mahurangi West Road is about 2 kms north of Puhoi on State Highway One. Our bed and breakfast is halfway between Orewa and Warkworth on the Matakana Coast. Find us on the map.